OSWEGO — Vadoud Niri of the SUNY Oswego chemistry faculty and his undergraduate assistants worked steadily — and quietly — for three years researching five common houseplants as agents for removing potentially hazardous chemicals such as acetone from the air. SUNY Oswego students Geoff Peterson (left) and Tim Jones (right) join chemistry faculty member Vadoud Niri in the Shineman Center greenhouse to demonstrate a technique for extracting samples from houseplants, which they have spent three years investigating for effectiveness in removing potentially hazardous chemicals from the air. Then the American Chemical Society took note of their work, and it is quiet no longer. Niri’s presentation at the society’s annual conference this summer — accompanied by an ACS news release and graphic animation of the experiments — attracted the attention of the Washington Post’s “Speaking of Science” blog and subsequent global attention from science mass media and “green” websites worldwide. Niri’s research on indoor plants began after a visit to a nail salon with his wife. The odor of acetone in the air quickly drove him out. Acetone is one of the volatile organic compounds (VOCs) that, if inhaled or ingested to excess, can cause health issues such as dizziness, nausea, shortness of breath, headaches, eye and throat irritation — eventually even liver and kidney damage or lung cancer. 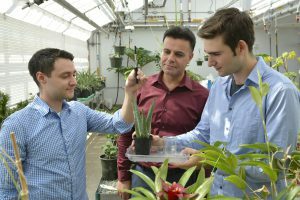 He and his students selected five types of plants to test: jade, spider, bromeliad, Caribbean tree cactus and a palm-like shrub called dracaena. They built a chamber for the testing, taking samples of the air exposed to the plants using a technique called solid-phase microextraction and analyzing them with a gas chromatograph/mass spectrometer in SUNY Oswego’s Analytical Chemistry Research Lab in Shineman Center. They determined the removal efficiencies and rates of different VOCs by each plant. Results to date show the bromeliads removed at least 80 percent of six different VOCs from the chamber’s air in 12 hours, while dracaena removed around 94 percent of the original target of Niri’s research, acetone. The college’s Scholarly and Creative Activity Committee provided grants to help fund Niri’s research. He thanked chemistry faculty colleague Shokouh Haddadi for her contribution in designing and testing the first experimental setup and the biological sciences department for giving him access to the Shineman greenhouse. Niri, whose doctorate is from University of Tabriz in Iran with post-doctoral work at University of Waterloo in Canada, said he, Jones and Peterson are preparing the study for submission to a scientific journal. Following that, he said, the research must be scaled up.